Have any of you played in other bands? We have all worked with other vintage singing groups, The Hollywood Starlets and The D-Day Darlings, we also sometimes perform solo singing gigs and of course we have performed with the AMAZING Sabaton which was a real thrill for us. How is it that you started playing music? We all came together through the Vintage Entertainment company Revival Live UK and auditioned to be part of The Bombshell Belles, so we met through singing but we spend a lot of time on the road together and are now really close friends as well as colleagues! What are your names? / Who plays what? / How old are you? Charlotte Brooks, Alana Shirley Nash and Alex Hans - we all sing seperate vocal lines, we mix it around sometimes but it tends to be Charlotte on alto, Alana on mezzo and Alex on soprano. Have you had other previous members? Yes we have quite a few girls who often sing with the Belles - Katie Ashby (who founded the group and runs Revival Live UK) Emily Jane Brooks (who is Charlotte’s sister!) Jessica Hudson, Emily-Louise Brown, Amy Rhiannon Worth and Charlotte McKay. Charlotte: My mum was a singing teacher so there was singing in the house from an early age and I’ve always loved singing and particularly the Vintage Era. Alana: Yes I’ve been singing since I was child, and I also run a Theatre School in Coventry ASA Theatre Arts training young singers & performers. Alex: The same for me, and I also run a Vocal Academy in Rotherham - The Voice Academy training aspiring singers. Alex: I’m from Up North! Yorkshire. What year did the band form? The band formed in 2012. What's your style of genre? We are very inspired by the Andrews Sisters and the great jazz singers of the 20s and 30s. We love vintage sounds with a modern edge. We like to think we have our own unique blend of vintage & modern that gives us our signature ‘Belles’ sound. What inspires you? Great music, great writing, dedication, passion, a love for art & life. How often and where do you rehearse? We rehearse a lot - sometimes several times a week, we have a studio in the Midlands in the UK (near Birmingham) called Riverside Studios where we have vocal rooms and mirrored studios to practice choreography so we’ve got a fantastic place to rehearse. The sound has really developed over the years and I think we’ve become more edgy and rocky. We are still true to our nostalgic roots but we love pushing the collaborative nature of the work and for example we’ve found a fantastic sound through our work with Sabaton. Charlotte: I also work for a big UK Car manufacturing company, I teach Zumba, and enjoy going to the theatre, and traveling. Alex: I am very busy with my vocal academy but I also love theatre trips, socialising, traveling and I have a little dog Rupert who likes to have all of my attention! Alana: Well, I’m also mega busy with my Performance Academy, and I’m a Mum which of course keeps me busy! I have to admit I’m Miss Jet-Set as I’m always traveling to some far flung destination...I have a serious case of wanderlust! Are you looking for a label, and what are your thoughts around that? Not particularly as we are managed by Revival Live UK who serve as our label, all music and social content is distributed by them. What made you decide to make this music? We all love singing, and there is nothing more rewarding than singing in close harmonies. It’s amazing when we come together, particularly when we’ve learned some new music lines and we hear them all together in harmony for the first time. What are your songs about? Well, it’s a mixture really, a lot of the songs we sing are about strength and resilience as they were composed during the war time era. We also sing a lot of jazz style songs about love. The old classic theme that never gets old! Have you done any covers live? We mostly perform re-imagined covers as our group pays homage to the classic singers of the 1920s, 30s and 40s. We did a vintage swing cover of The Last Stand by Sabaton which was great fun as it was such a different style to the original version (which we all love!) so it as fun creating something completely new. What language do you sing in? 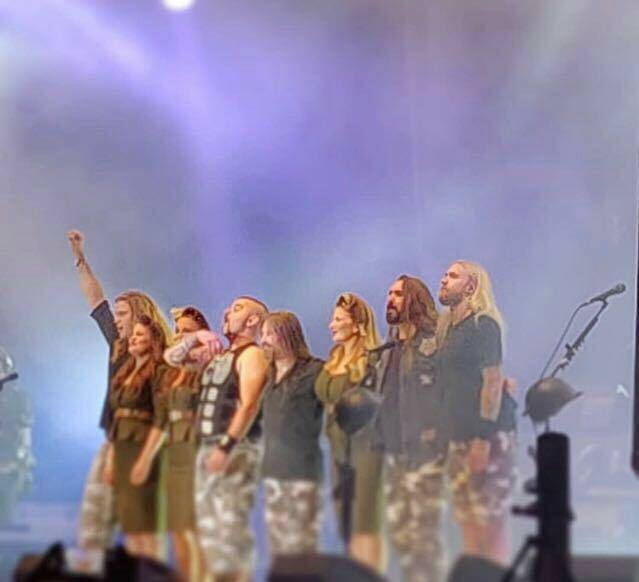 We sing in English mostly but we learnt some songs in Swedish for Sabaton Open Air 2018 - it was fantastic! What are the least and most people to attend one of your gigs? Gosh, we’ve had some very intimate audiences and some huge crowds, it would be hard to say a number! Do you have a regular place you play live often? Yes, we do have a few gigs that we do every year - certain festivals and concerts in the UK. What was your first gig like? Our first gig was a 1940s Hangar Dance in Ireland which was great fun! What was your latest gig? We were very busy before Christmas with lots of festive appearances, we played for the light switch on in Birmingham in the UK in December, as well as many other smaller shows, we’re now taking the opportunity as January is quiet to get the diary in order for this year and rehearse any new material. Where have you played live this year? Last year we spent a week in Cologne for GAMESCOM playing live on the World of Tanks stand which was great fun, we played Milan, the Channel Islands, we’ve also played at the Chalke Valley History Festival and Sabaton Open Air, we play a lot of RAF bases and 1940s weekends. What do you think of my work? We’ve enjoyed being interviewed thank you! How do you think and know that this interview will help you in the music business? Hopefully your followers and readers may be intrigued or interested to find out a little more about The Bombshell Belles. Do you have any role models or idols? Definitely The Andrews Sisters, Ella Fitzgerald, Amy Winehouse, The Puppini Sisters, Doris Day, Peggy Lee, Caro Emerald. Is it easier to find inspiration from older bands, or bands that are more active today? Well, a bit of both, but we’re old fashioned gals! What advice would you give other bands or artists? We’d say keep going - it’s sometimes hard work but the rewards are always worth it. Perseverance is key. How do you get psyched for a gig? We practice, we run through music and choreography, we get glammed up and we drink plenty of water.